"Three Revolutions is a bold attempt to weave together the latest global developments in transportation, drawing on research in a variety of topics ranging from technology to economics to urban planning. Sperling and his colleagues make targeted recommendations for policy that can guide the new automated, electric, shared vehicles toward a bright future, while also sounding a clear warning about how these developments could actually make pollution, inequality, and congestion worse." "Three Revolutions is essential reading for anyone interested in how technology and mobility will shape our communities and our lives. This extremely timely book helps to inform the various decisions we need to make as these new technologies emerge. In Sacramento, we are implementing some of the innovative ideas in this book in an effort to lighten our environmental footprint and become a technology leader. Our cities need to define their own destiny as new opportunities emerge. This book shows us how." "Dan Sperling understands the mix of business, policy, and markets necessary for the transformational changes that will lead us to a greener future. He and his coauthors expertly show the importance of electrification and shared rides as global cities transition to automated vehicle technology." Stella Li, President of BYD Motors Inc.
"Three Revolutions is a must-read for anyone who cares about guiding our cities to a safer climate future. A technological revolution alone will not get us there. This thoughtful book shows us how to drive policy change at the federal, state, and local level that will advance the three revolutions of electrification, automation, and pooling together While America waits for the return of strong federal leadership, we can and must make continue to make progress at all levels of government." "As Executive Director of the Transportation Research Board, I have an appreciation of the depth and quality of policy analysis and research that Dan Sperling and the other coauthors of Three Revolutions have contributed to this issue. They have clearly articulated and analyzed the choices we have in front of us and assessed the potential positive or negative consequences that might occur based on the policy choices that get made, or not made. These choices can make the difference between whether we have a safer, more sustainable, healthier, more livable, more equitable, and more economically viable future, or one where we are lamenting the negative consequences of the technological changes that have occurred. Three Revolutions gives us the insights needed to help make the wise policy choices." Three revolutions will fundamentally change transportation. But whether these changes will be for better or worse for social equity, traffic congestion, pollution, and energy use, will depend on the policy choices we make now. We're happy to welcome back UC Davis Professor - and transportation expert - Daniel Sperling for a presentation of his fascinating on book on vehicles of the future, Three Revolutions on Thursday, April 26th at 7:30 p.m.
Transportation is on the cusp of revolutionary change. With electric, automated, and shared vehicles no longer imaginings of a distant future, we have the potential to create a dream transportation system: one that reduces traffic congestion and greenhouse gas emissions, increases accessibility and affordability, and creates healthier, more livable cities. But this scenario is not guaranteed. How we guide these transportation revolutions will determine if they change our lives and communities for the better—or for the worse. In Three Revolutions, Daniel Sperling and his coauthors share timely guidance and make policy recommendations to steer these revolutions toward a sustainable, livable, and equitable future. As ridesharing services like UberPool and Lyft Line gain popularity, electric vehicle technology advances, and automated vehicles are tested on streets around the world, Sperling offers research-based insights on the potential impacts of the three revolutions and the need to consider the revolutions together. This book is for anyone who cares about transportation, cities, the environment, and the social well-being of our communities. Daniel Sperling is founding Director of the Institute of Transportation Studies at UC Davis and co-director of the National Center for Sustainable Transportation at UC Davis. He is a distinguished professor of civil and environmental engineering and environmental science and policy at UC Davis, and is a member of the influential California Air Resources Board. Other collaborators include: Anne Brown, Robin Chase, Michael J. Dunne, Steven E. Polzin, Susan Shaheen, Brian D. Taylor, and Levi Tillemann. Download the accompanying PowerPoint presentation by Daniel Sperling here or read it below. Download these policy briefs and see the ideas from Three Revolutions in action. 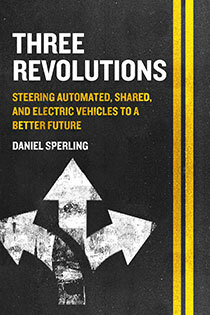 In Three Revolutions, transportation expert Dan Sperling and his collaborators share research-based insights on potential public benefits and impacts of the three transportation revolutions of vehicle automation, shared mobility, and vehicle electrification. They describe innovative ideas and partnerships, and explore the role government policy can play in steering the new transportation paradigm toward the public interest—toward our dream scenario of social equity, environmental sustainability, and urban livability. Check out Chapter 6: Bridging the Gap Between Mobility Haves and Have-Nots by Anne Brown and Brian D. Taylor below. In this episode, Dan Sperling is interviewed by Jeff Wood, host of Talking Headways podcast, about his new book, Three Revolutions: Steering Automated, Shared, and Electric Vehicles to a Better Future. Three Revolutions looks at how automated, shared, and electric vehicles are transforming the transit landscape and how policymakers can steer this technology in a sustainable, equitable direction. Listen below and read an excerpt from Three Revolutions here. A Changing Climate Means A Changing Society. The Island Press Urban Resilience Project, Supported By The Kresge Foundation And The JPB Foundation, Is Committed To A Greener, Fairer Future.​ A Version of This Op-ed Was Originally Published June 26, 2018 in CityMetric. “Grace” is a single mom with two kids living in Los Angeles’ Koreatown. Because high rents have put car ownership out of reach, Grace endures a hellish daily commute. Each weekday, she rises at 5:30 a.m. to dress and feed her children and walk them four blocks to her cousin Lydia’s apartment; Lydia then walks Grace’s daughter to daycare and her son to elementary school while Grace makes a 75-minute, two-bus trek from Koreatown to her job as a teacher’s aide in Westchester. The trip home in the afternoon is just as bad, and Grace struggles to get dinner on the table by 7:00 p.m.
Transportation, like so many aspects of American society, is divided between haves and have-nots. While the mobility “haves” enjoy a wide array of travel choices, for the have-nots everyday travel — trips to work, daycare, the grocery store — can be lengthy, complex, or even impossible in a car-dominant society. “Grace” is fictional, but her plight — and that of the “mobility have-nots” — is real. While just eight percent of American households are without cars, carlessness is spread unevenly across the population and concentrated among some of the most vulnerable travelers. More than one-fifth of households earning less than $25,000 a year don’t own a car; African-American households are car-less at nearly four times the rate of whites. At the same time, the current status quo — with a sharp divide between auto-mobility haves and have-nots — is being upended. The much heralded mobility revolution — which includes ride-hailing services like Uber and Lyft and (down the road) automated vehicles (AVs) — could make traveling much easier for people like Grace. Or they could make it worse. In the dream scenario, on-demand vehicles are affordable and widely available, expanding access and mobility for those currently struggling to get around. But there’s an equally plausible nightmare scenario: that new technology exacerbates mobility inequalities. We’re now at a crossroads where policy actions can help to determine whether the dream or the nightmare prevails. The primary issue is whether these transportation revolutions will change the cost and access calculus for car travel. The evidence, so far, is mixed. Early studies show that ride-hailing services like Uber and Lyft may improve mobility for low-income and car-less travelers. In San Francisco, one-third of Lyft and Uber users earn less than the median income. In New York City, ride-hailing provides better service to the outer boroughs than taxis. But research from other cities also shows that higher-income adults with more education comprise a disproportionate share of ride-hailing users, suggesting that these services may be out of reach for some low-income travelers. With car ownership out of reach for many mobility have-nots, it’s likely that future automated vehicles will also be too expensive for many households to own. But fleets of AVs owned and operated by mobility providers may sharply reduce per-trip costs, greatly expanding auto access for disadvantaged travelers. Because they can offer point-to-point services on demand, AVs may extend mobility to those too young, old, or physically impaired to drive. The cost of such services is expected to be well below today’s Lyft and Uber-like services, since fully automated vehicles will save money by not requiring a driver. Automation and ride-hail services are well suited for the short point-to-point trips that are common in dense urban environments. New services could also supplement scarce or non-existent public transit service in suburban and rural areas, and greatly expand access for those without auto access. Automation may also benefit lower-income users, as ride-hail services and transit agencies could save on labour costs, enabling them to offer trips at lower prices. But, without the right public policies, shared and automated services can further disadvantage mobility have-nots. One immediate problem is that Lyft, Uber, and other services require users to have a smartphone and a credit or debit card. About one-third of all Americans did not have a smartphone as of 2015, so it is possible that large shares of the population are excluded from these services. Even more troubling, substantial overlap exists between the car-less, who are already vulnerable and face transportation hardship, and those lacking smartphones or credit cards. As shared and autonomous vehicles spread, they could undermine existing public transit services by diverting transit riders to new services. With fewer riders, transit agencies could lose fare revenues and the justification to provide transit service as frequently or at all. Public transit currently provides important mobility options for the car-less. While supplementing or replacing fixed-route, fixed-schedule transit with shared or automated cars might provide more access for some, it could also reduce mobility for the elderly, wheelchair-bound, sight-impaired, and other travelers who rely on lift-equipped transit vehicles, or the assistance of experienced paratransit drivers. Travelers can be excluded if they do not have access to new technologies, or cannot afford new services, or cannot physically access automated or shared vehicles. But they can also be excluded through discrimination. Studies find that Lyft and Uber drivers cancel rides requested by African-Americans at higher rates than they do for other riders. Presumably, automated shared ride vehicles would address this sort of discrimination. Public policies can address these equity challenges and help reduce mobility costs for have-nots. There are some encouraging signs that policymakers are taking seriously the potential perils of shared and automated transportation. But more must been done to regulate shared and autonomous services to move transportation equity in the right direction. For example, streamlined fare-payment systems can integrate all regional modes, from transit to ride-hail to carshare, and subsidise low-income travelers. Requiring that ride-hail companies share passenger data with local governments can help monitor service delivery and cut down on discrimination. Cities such as Ottawa and Portland, Oregon have implemented rules for ride-hail companies to provide a certain amount of wheelchair-accessible service, and levy small fees on rides to fund accessibility programs. Policymakers can also encourage the development and deployment of tools and apps to make vehicle sharing more affordable. Recent apps that compare prices and times of travel options, such as RideScout and Citymapper, offer more transparency for users and incentivise services to lower their prices in order to compete with other modes. The wheels of government move slowly, but some local and regional bodies are beginning to plan for the impacts of the mobility revolution on their transportation future. The widespread use of shared and autonomous vehicles may still seem distant — but experience tells us that the time for policy innovation is in the midst of transition, before stakeholder positions harden and change becomes more difficult. Without early policy interventions, the mobility gap between the haves and have-nots might well widen into a chasm.